“Mom, what’s for dinner? Honey, what’s for dinner? Self, what are we going to have for dinner?!? !” On some days, this question can feel like a 50 lbs bag of stress. Hopefully by now, you know I get you. Although I love cooking (mostly eating), somedays I’m too tired and just don’t want to cook. 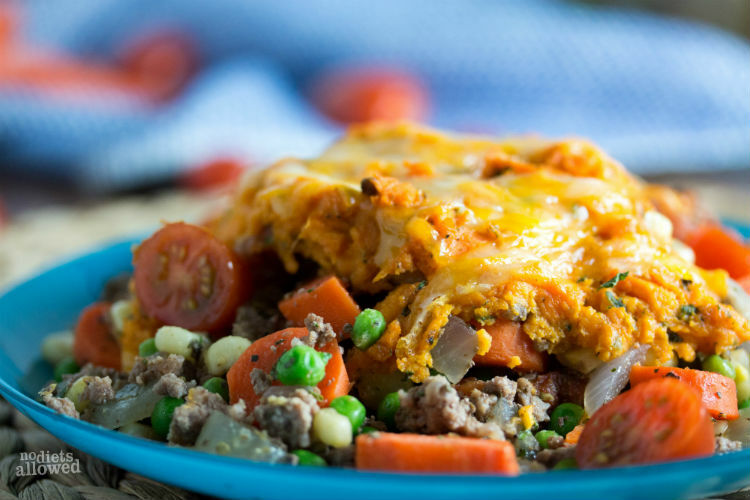 Take a deep breath with me and get ready for this ridiculously gorgeous, this-is-2015 healthy Shepard’s Pie casserole. Pst… you can even double the batch and freeze one to eat on another crazy, busy, hectic day. I have a problem. I’m seriously addicted. I love LOVE the bright, beautiful colors and flavors of vegetables. Especially organic vegetables. I know, I know, I’ve mentioned it before but I can totally taste the difference. I was instantly converted when I had a horrible, chemical aftertaste when eating a carrot one day. I only buy organic carrots from now on. Costco makes it pretty easy to have large bags of frozen organic vegetables on hand. Next trip, just stock up on organic frozen peas, frozen sweet corn, and a large bag of organic carrots. 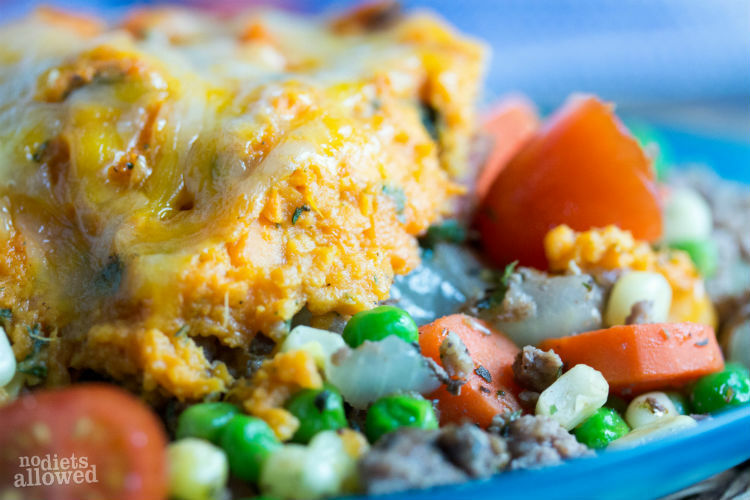 I have plenty of go-to recipes that call for these tasty veggies. Stick with me and I promise they won’t go to waste. Just to make it even easier for you, here are ingredients I use. My kitchen would feel naked without my large container of spices. They last a long time (and store great) even though I’m using them constantly. Spices punch out the natural flavors of the vegetables. And it’s a much healthier option than to throw in gravy or (gasp!) a can of mushroom soup. Is it even soup? What mystery ingredients make up those condensed soups anyway? I digress. I love eating. That’s why I cook the way I do. I promise I’m not lying when I say that I actually enjoy eating healthy. I don’t starve. I don’t count calories. I eat until my stomach is about to explode and don’t even think twice about it because I’m eating highly nutritious (and highly delectable) foods. Come let me help you learn how! Play my 6 week Game-On or 21 Day Health Challenge and actually have fun getting healthy! You’ll quickly learn why I’m passionate about healthy living when you feel how great it feels. In a large pot, bring 8 cups of water to a boil. Add yams/sweet potato pieces. Boil for 15 to 20 minutes until soft. Drain well. Return to pot. Add 1 Tbs parsley, 1/2 tsp salt, and 1/2 tsp pepper. Mash yams/sweet potatoes well while mixing in spices. Meanwhile in a large frying pan over medium heat, brown ground beef/turkey with garlic and onion. Once browned, add carrots to meat mixture. Continue cooking for 3 to 4 minutes until carrots are slightly tender. Add peas, sweet corn, tomatoes, 1 Tbs parsley, 1/2 tsp salt, 1/2 tsp pepper, oregano, and basil in the meat mixture and stir well. Cook for additional 2 to 3 minutes until heated through. Removed from heat. 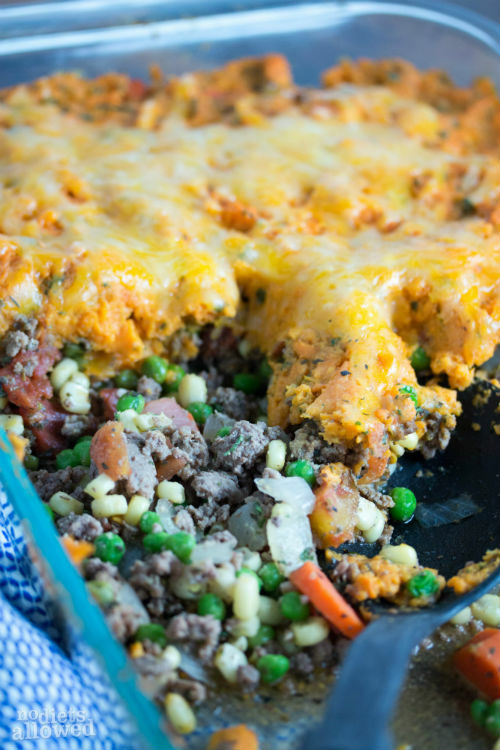 In a 9x2x13 baking dish, pour and spread meat mixture evenly on the bottom. 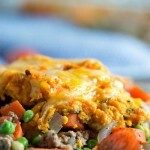 Spoon yam/sweet potatoes over meat mixture and smooth over top. Bake at 400 for 10 minutes. Sprinkle cheese over the top and bake for additional 5 minutes. Based on the ingredient list, this seems like it would be very dry. Thoughts? On the contrary, Kathy! The vegetables are juicy and flavorful. I promise it’s not dry. Great question, Heather. It can serve 4 to 6 people. 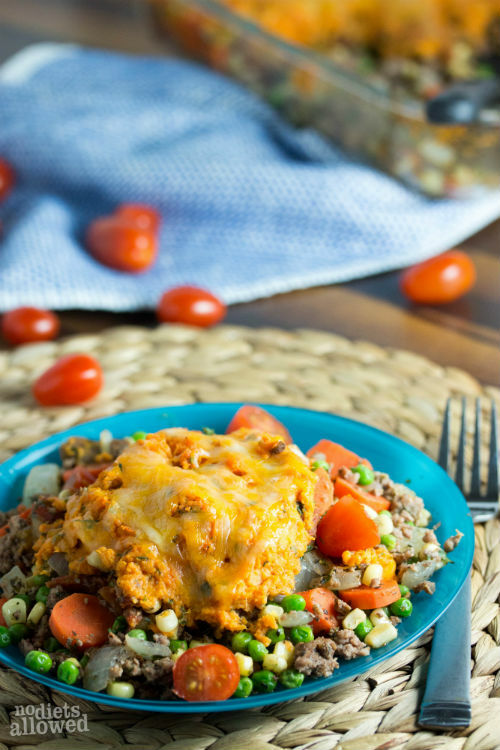 I love making the full-size for my small family because my husband takes leftovers for lunch the following day.